An Ethiopian Airlines Boeing 737 passenger jet to Nairobi crashed early on Sunday killing 149 passengers and eight crew members, the airline said. A four-month old Ethiopian Airlines Boeing plane en route to Kenya's capital, Nairobi, carrying an estimated 149 passengers and eight crew crashed on Sunday, the airline said in a statement. The crash is the second in five months involving a Max 8 after a Lion Air plane that had been delivered only 2 1/2 months earlier nose-dived into the Java Sea shortly after takeoff on Oct. 29, killing all 189 on board. Boeing Co. is aware of the Ethiopian crash reports and is monitoring, it said in a statement on its website. The plane left Addis Ababa, Ethiopia at 8:38 a.m., and contact was lost six minutes later, according to the airline's statement. "Rescue operations are in progress and we have no confirmed information about survivors or any possible causalities," the airline said. The airline said it is still confirming details of the passenger list for the flight. 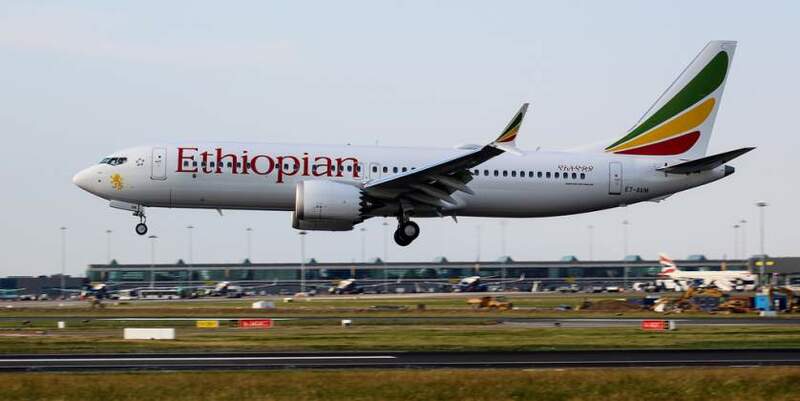 The Ethiopian government "would like to express its deepest condolences to the families of those that have lost their loved ones on Ethiopian Airlines Boeing 737 on regular scheduled flight to Nairobi, Kenya this morning," Prime Minister Abiy Ahmed's office said in the Twitter post. The crash involved the latest Max 8 version of the Boeing narrow-body, Ethiopian said. The aircraft concerned, which bore the registration ET-AVJ, it said, was delivered new on Nov. 15, according to Flight Global's Cirium database. The jetliner was fitted with two CFM International Leap-1B engines. Poor safety procedures and the inability of pilots to gain control of a malfunctioning aircraft may have contributed to the Lion Air crash, the first accident involving a 737 Max since the model entered service in May 2017, according to a preliminary report from Indonesian investigators.